It’s a question fans often have to ask themselves when they embark upon a multiple-book fantasy series. Robert Jordan’s Wheel of Time series started in 1990 and eventually outlasted Jordan, who passed away in 2007. George R.R. Martin is under siege for his Song of Ice and Fire series, which began in 1996. Why? He’s “only” five books into the series, and fans want new books NOW! 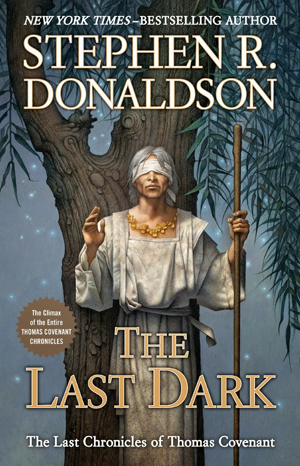 That brings us to “The Last Dark,” the culmination of the Last Chronicles of Thomas Covenant and of the 10-book series. Author Stephen R. Donaldson has stated that he originally did not intend to go beyond the initial three books (published 1977-79), but here we are. The final book has everything most fans of the series would want: main characters like Thomas Covenant, Linden Avery and her son, Jeremiah, and Lord Foul; beloved supporting characters like the Haruchai, Ranyhyn and giants; and surprises throughout, many of which harken back to earlier books in the series. The plot? In short, the Worm of the World’s End, an amazingly powerful force, is set to obliterate the Land and destroy the Arch of Time, allowing Lord Foul to escape the world and take on The Creator. The only ones standing in the way are Covenant, Avery, Jeremiah and a small troupe of the Land’s defenders. Sections of gripping action are followed by necessary, but perhaps unnecessarily long segments. Yet Donaldson remains a skilled storyteller who weaves in deep themes, and his love for not-often-heard words like “puissance” remains intact. And the ending? Well, it wraps things up, but it probably won’t satisfy all the fans of the series. Plus, a suspicious person might think there are still enough loose threads to forge another sequel. But for most, it is the finishing point. The wait is over, the story is done — hope you enjoyed the journey.